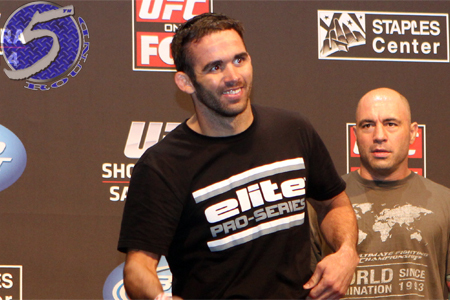 Jamie Varner (Pictured) was winning the standup battle against Joe Lauzon in the opening stanza, so why did he decide to go for takedowns as their scrap went on? Were you asking yourself this same question on Saturday night? As it turns out, Varner had not choice but to change up his strategy after breaking his right haymaker during the middle frame. “Looks like I broke my hand. I mean you can kind of see it, the knuckle is gone,” Varner revealed on the FUEL TV post-fight show. “When one of my right hands landed it was gone, it hurt pretty bad. It was in the 2ndRound. I slipped his jab and I came over with an over head right and hit his head and I felt it right away. Varner’s night wasn’t a complete wash. Not only did he step up for the second consecutive time on short notice to post an impressive showing, but also left Los Angeles with an extra $50,000 for his part in ‘Fight of the Night’ honors. UFC on FOX 4 took place inside Staples Center in California.